On March 25, 2012, Their Serene Highness Prince Albert II and Princess Charlene of Monaco were in Enontekiö, Finland for a brief visit. Later this week, Prince Albert II will give a speech at the World Indigenous Television Broadcasting Conference (WITBC) regarding “…adaption to climate change and protection of the Arctic” according to Sámi 12 WITBC. 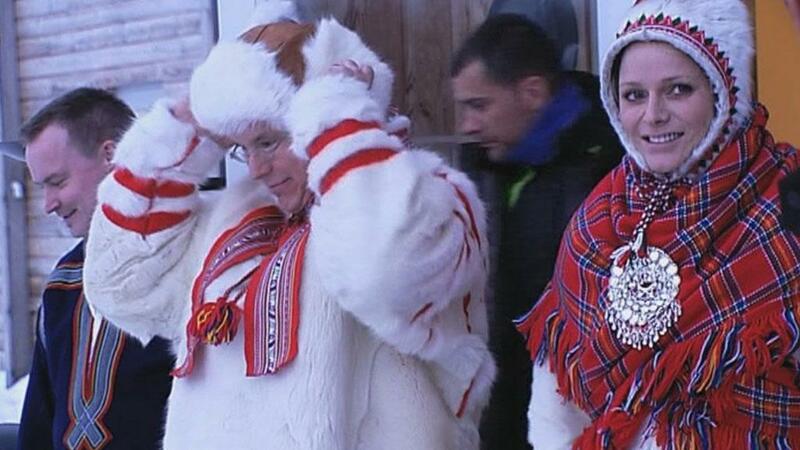 The princely couple will travel to Lapland from 25 to 27 March 2012. Visits on the ground and the conferences will be devoted to the major issues of adaptation to climate change facing indigenous populations which are reviewed by the Fondation Prince Albert II de Monaco. During their stay, the prince and princess will have the opportunity to see the progress and results of projects such as those that are introduced in the International Polar Year, and which are driven by the Arctic Council or the UNEP. An agreement will be signed between the Prince Foundation and the International Centre for Reindeer Husbandry to support young researchers from Arctic regions. To learn more about the World Indigenous Television Broadcasting Conference please click here. Sources: Palais Princier de Monaco, Barents Observer, Sámi 12 WITBC and Iltalehti. On Saturday, March 24, 2012, Their Serene Highnesses Prince Albert II and Princess Charlene of Monaco along with Her Royal Highness Princess Caroline of Hanover and Miss Charlotte Casiraghi attended the 2012 Bal de la Rose held at the Salle des Etoiles at the Sporting Club de Monaco. The famous ball benefits the Fondation Princesse Grace and this year’s theme was, Swinging London. Musical guests included Mark Ronson, Pete Doherty, and Imelda May. Attendees at this year’s event included blonde buxom Swedish model, Victoria Silvstedt, Prince Salman bin Abdelaziz of Saudi Arabia, Jacques Grange, the Duke and Duchess of Castro, and Miss China 2011 Luo Zilin to name a few.